Fact: There is nothing I loathe more than hitting my stride during a tough workout only to have to pause to fix my hair. Yet that’s been my reality for much of the past several months. After only needing a single hair elastic to contain my waist-length hair for years, my troubles began when I cut it all off into a short shag cut early this year. It turns out piecey layers and burpees don’t really mix without an arsenal of bobby pins to hold down the fort—a lesson learned after one too many classes spent wiping sweaty hair out of my face. My hair has since grown out a few inches, and I’ve gingerly started branching out with new workout hairstyles to see if my layers and former bangs are just long enough to stay put on their own. (It’s kind of like a game of bobby-pin Jenga: How many can I take out without my locks tumbling down?) With slightly longer hair comes more possibilities, but it’s still a tricky balance, to be sure, especially as I continue to amp up my fitness regimen. And with this all in mind, I thought it might be time to formally pit a few different “gym-approved” hairdos against each other to see how well they can really withstand an all-out sweat sesh. 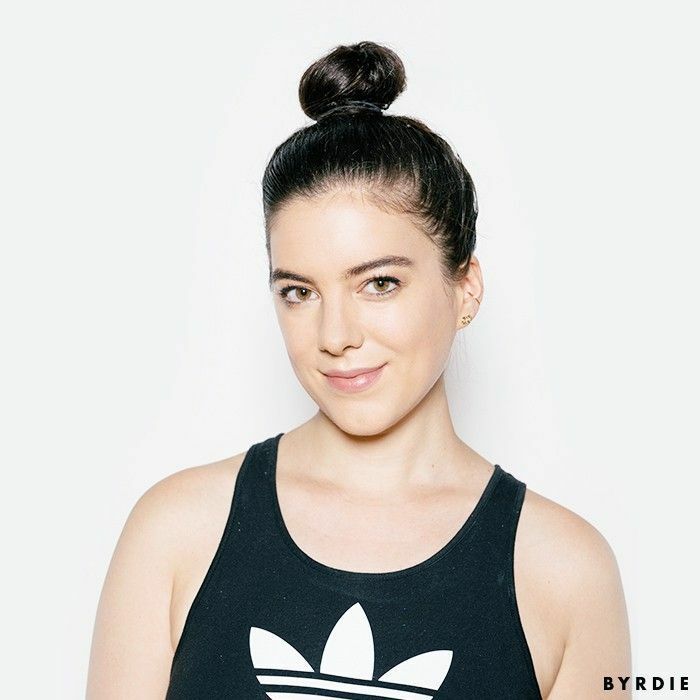 Those of you who follow Byrdie’s Snapchat (@byrdiebeauty) saw the challenge go down live: Three days, three tough workout classes, three hairstyles, and three quick (but honest) reviews. But keep reading below to get the full story, as well as a look at the before and after photos for each ’do. Ah, the old classic. When you’re growing out your bangs, there’s nothing—nothing—like that moment when your fringe finally reaches your ponytail, which arrived for me a mere week or two ago. But in order to ensure a flyaway-free zone, I relied on my favorite trick: soaking my hair with a treatment balm and then pulling it back. In addition to making the bun look super slick, I like knowing that I’m actually improving my hair while working out, especially since I’ll be washing it afterward anyway. (Yay for multitasking!) My go-to product is Christophe Robin’s Lavender Oil ($47), which has an amazing, thick texture and smells positively divine. Considering all the burpees and jumping around this class entailed, I was pleasantly surprised that I never had to wipe a solitary strand from my forehead—and even more so afterward, when I saw that my hair basically looked exactly the same as it had beforehand. That leave-in treatment trick really works. During the early days of my shag cut, tying my bangs and front layers into a teeny-tiny knot on top of my head got me through many a yoga class. So I thus assumed this would be a solid choice for a session at Y7, a bicoastal yoga studio that I love for its tough, candlelit flows and bumping playlists. This ’do used to require some intricate maneuvering, but now that my hair is a little longer, it’s pretty straightforward: I simply gather the top half of my hair into a ponytail, fold it in half, and secure the loop with an elastic. It’s really hard to feel zen in Warrior II when you’re peeling sweaty hair off your forehead. Y7’s classes are slightly heated and definitely intense, and while this hairstyle might have been fine for a lower-key vinyasa—especially when my hair was about three inches shorter—it was not doing it for me that night. I’ll give it a couple of measly points for still looking cute after class, but other than that, it was a fail as far as this challenge is concerned. Womp womp. I’d be remiss to skip boxer braids, so I saved the style for a session at Platefit, a boutique fitness destination in West Hollywood with a quirky MO: It’s an aerobics class conducted on Power Plates, which are vibrating platforms endorsed by everyone from NASA to Madonna. The vibrations force your muscles to contract 30 to 50 times a second, exponentially amping up whatever exercise you’re engaging in. Because of this, the classes are merely 27 minutes long—the perfect pre-work fitness blitz. This was definitely the least sightly post-class look of the three, but frizz and flyaways aside, it definitely served its purpose—my layers miraculously stayed put during class, even through several rounds of jumping jacks. I can’t take complete credit for my tight braiding skills—I’m guessing the sizeable dose of R+Co’s Outer Space Flexible Hairspray ($29) I used beforehand is really the responsible party here. And then there’s the other bonus of wearing braids: When you take them out, you’re left with perfectly tousled waves. Since I had to head straight to the office after class, it was a nice alternative to throwing my hair up into a bun or ponytail. Can I offer winners in different categories? For prettiest post-class look, the edge goes to the half-knot, which somehow looked even better after that steamy yoga class—even if it made me miserable during. The boxer braids get top marks for versatility. But if we’re gauging which look was truly the most sweatproof, the real champion was the good old topknot—in addition to still looking sleek after a tough sweat sesh, it also required the least hassle. What’s your go-to gym hairstyle? Which was your favorite of the ones seen here? Sound off in the comments below.